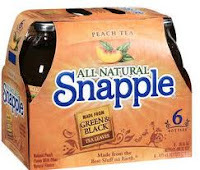 Hurry and print this $1/1 6-pack Snapple coupon! This coupon is valid on glass bottle packs of tea or juice. I doubt this one will last long, so click here to get it now!